Desert Ashes just came out a few weeks ago, and I want to thank the PS Vita fans who have been playing it so much. Now I’m back to announce a spinoff of the Desert Ashes franchise. This time it’s something special — I’m sure many of you know the succesful game and comic series Pocket God. 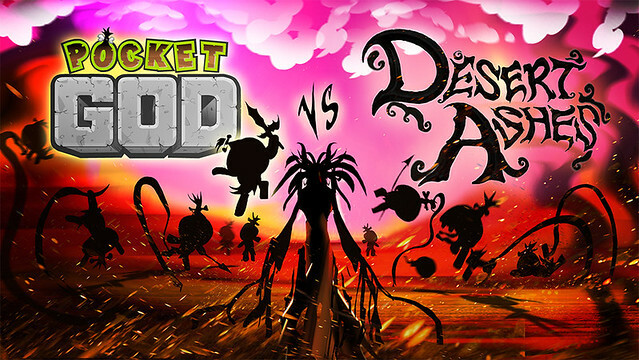 We have partnered with Bolt Creative to bring you Pocket God vs Desert Ashes. In a way this title was always meant to happen. A few years ago I was reading a interview with Dave Castelnuovo, and I saw how much he had liked my old title Mecho Wars. Then I mentioned on Twitter that I was playing Pocket God, and Dave saw. We both loved each others’ work, and I got to work with Bolt Creative at one point with both Dave and Alan and it was a fun experience. So once I finished Desert Ashes last year, I decided to hit them up to make this happen. 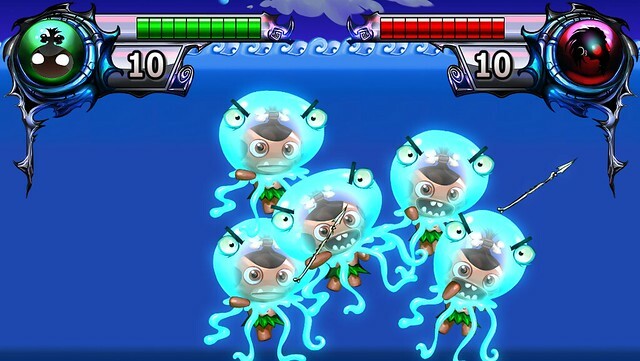 Pocket God vs. Desert Ashes will play similarly to Desert Ashes, so you will get the usual campaign, skirmish and multiplayer modes. To celebrate this annoucment, there will be double XP in Desert Ashes for the next 48 hours. I’ve known Luc for some time. 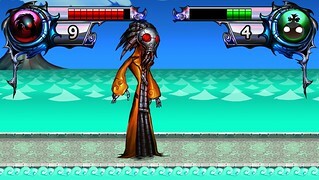 We were both around in the early days of the mobile gaming revolution, and he was kind enough to create this game/cross over with characters from both our games. 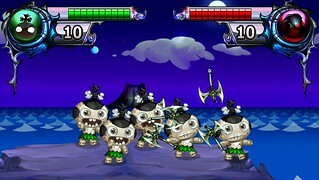 Like he said, I really love Mecho Wars and it’s awesome to be a part of its spiritual successor. I’ve owed my PS Vita since day 1, and before that I remember standing outside the Metreon all night to get my PSP when it launched. PS Vita is such a great gaming platform; it’s the only mobile device that has real console-like controls and marries that with things we play with in the mobile world like touch screens and accelerometers. I hope this is the first of many games we launch on the platform. I’m a huge fan of Luc’s work, so I was excited when he came to us with the idea of mashing up Pocket God with Desert Ashes. As the designer of the Pocket God characters, I personally get a kick out of other interpretations and Luc’s are awesome! I love the off-center humor he injects into everything and it meshes great with the PG humor. As a bonus, he added a few new characters, which I think are fantastic! Just wanted to say thank you for including PlayStation TV in your blog post. You’re setting a great example for other developers and blog posters, reminding them that its a thing. There is definitely something about Mecho Wars (and now Desert Ashes) that really clicks with me where other strategy games don’t. I bought the add-on campaigns for Desert Ashes and I play a little bit every night. Gotta get some of that extra XP! +1 PSTV. I just bought a new monitor so I could have my PS4, PSV, and PC all plugged in. I love the gameplay and art of Desert Ashes/Mecho Wars, and bought all three “episodes” currently available. I do hope that there’s more DLC coming! Sony’s QA only does compliance checks for third parties. They check for issues such as crashes, save file corruptions and proper button icons (there are many other mandated checks). Their responsibility is making sure every game provides a consistent, user friendly experience. Issues such as grammar, framerate, resolution, general bugs (textures missing, algorithms malfunctioning) are not covered under first-party compliance checks, and fall on the responsibility of the developer, not Sony. Can you fix the multiplayer for desert ashes? I just finished episode 2 of Desert Ashes and I’m really enjoying the game. I have bought ep 3 as well and hope more are on the way. is it dlc or what?